Would This Building Make You Want to Eat Bugs? As you already know, we're going to have to start eating bugs if we want to avoid mass starvation in the near future. But how do people from non-bug-eating cultures get over the ick factor? 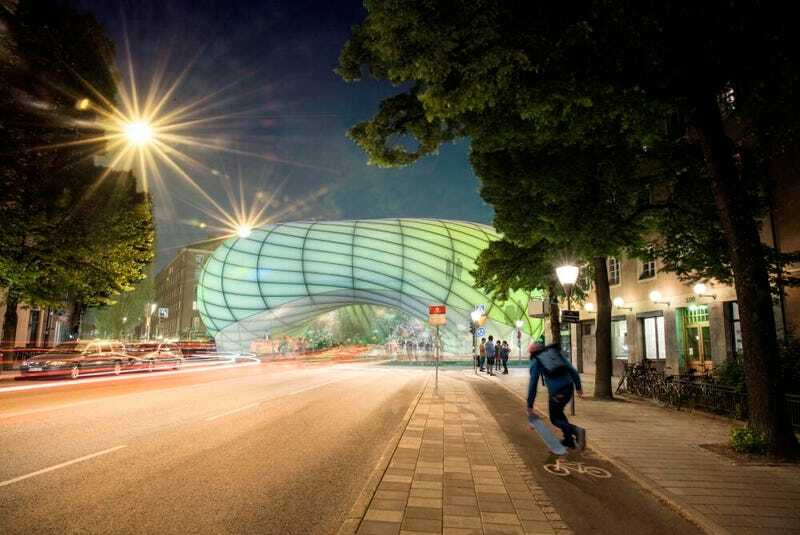 Swedish architecture firm Belatchew Arkitekter has come up with a plan so bizarre it just might work. Their idea is to fill Swedish city Stockholm with several of these glowing, donut-shaped buildings called "Buzz Buildings." Each one would be a beautiful greenhouse, full of lovely flowers that attract many insects — including bees, butterflies, and more. But you wouldn't be eating these endangered insects. Instead, you would eat freshly-harvested insects from the Buzz Building's cricket farm. Then, in the basement, there would be a bug restaurant. You'd experience the lovely ambience of cricket chirps, see how nice their habitats are, and then snarf down a giant, fried cricket taco. Or baked cricket casserole. Or some kind of spicy cricket pastry. Hey, it's no weirder than having a seafood restaurant next to the Monterey Bay Aquarium (yes, this is an actual thing that exists).